A “Breakeven” at $452M Box Office Gross which is what it probably would have taken for JC to break even, budgeted as it was. A “JC2 Sequel Breakeven” at $350M Box Office Gross which is what I think it would take for a sequel to breakeven with some modest budgetary reductions, the major portion of which would be achieved simply because the one time costs would get spread among three movies, instead of being born by one. And puhlease! This is not a post that evaluates the politics of it all, the stench/stigma that is attached to the movie (and being slowly dissipated, thanks to the fans) …..it’s not a post about Iger and how he’ll never do it, etc. This is just looking at the numbers — a Saturday night exercise done mainly to share with people in the fan groups who are talking about this and wondering what the numbers are. Click to enlarge if it’s too small for you. The point is …. breakeven becomes a lot more attainable if the budget is reduced — global theatrical gross would only have to increase from 282M to 350M. But if the budget stays where it is, then it would have to increase to $452M, and it would be hard to convince any studio head that it would increase that much. That’s why, in my view, the key is to find a way to reduce the budget from 250m (before tax rebates) to $175M (before tax rebate). How to do that without compromising production value? First of all, the one-time costs have already been absorbed in JC1. What happens in Hollywood is that if it’s a one-off, then all of those costs are assigned to one film. If it becomes a series, then they make an adjustment and spread those costs over the whole series. If the series is a trilogy, then those costs would get shared 33% to each movie. That means the loss on JC1 would be lessened. Let’s say the one time costs incurred for JC1 are 60M, which I think is a fair assumption, that means that the JC loss would be reduced by 40M, and then each film in the series could only have to bear 20m each. So that produces not only a 40M savings on the production budget of JC1 — but also JC2, because it would only be carrying 20M in onetime costs, instead of $60M. So there is $40M of your savings right there. You only need to find another 35M. If there was a will to do this, it could be done. Anyway, those are my musings on a Saturday night. Too bad Irvin Kershner and Leigh Brackett are no longer with us. Then again any replacing director would had to deal with the mess Stanton left, with Shape Shifter Shang and his latest bad scheme, Mopey finding new reasons to be whiny and whatever Stanton and his minions did to Issus and the First Born. A new director would just need to start over. But as mentioned Disney doesn’t care so there is that. It’s an interesting thought to contemplate Stanton perhaps taking on the role of producer or EP and let someone else direct . . . . but I just don’t think Disney management as it is currently configured has any appetite for any male oriented fantasy action/adventure — they bought Star Wars, and they have the whole Marvel collection — that’s enough in the male adventure category. The great irony about John Carter is that, it being a Disney film, they would have been much better off calling it “A Princess of Mars” and building the marketing around Dejah…. I really have often wondered what would have happened if Disney went all-in on the “Princess” factor and APOM . . . . . . especially given the degree to which Stanton went “warrior princess” with Dejah……. I doubt The Lone Ranger bombing will help John Carter. Disney will look at the big three disasters of the Lone Ranger, John Carter and Mars Needs Moms all of which were designed to increase Disney’s appeal to male audiences and run as fast as possible back to their princess movies. Between those three films and other bombs in the same vein like Prince of Persia and Sorcerors Apprentice Disney must have loss over half a billion dollars trying to expand their brand. One possibility that appears to have been overlooked in this discussion is the idea of replacing Andrew Stanton for a sequel. While it would be great to have the consistency of the same director, it might be beneficial to have the sequel directed by someone new. A different director would not be saddled with the bitter baggage Stanton seems to carry at this point and for its part, Disney could perhaps feel more confident using a director experienced in live action films. Disney would no doubt learn from its missteps in promoting the first film and presumably do a better job marketing the second. And frankly, the massive loss reported for The Lone Ranger can only help further whatever small hope there may be for a JC2 – both in giving Disney perspective and taking some of the sour out of the financial loss on JC. I don’t understand the calculation Disney made either. Accountants rule the world! More than likely the movie won’t have a b.o. equal to his budget, which means anemic net grosses, and I don’t really see the marketing as being significantly less than John Carter’s. How on earth can the loss be less? Not wanting to humuliate Depp and Bruckheimer probably had something to do with Disney not declaring the loss so quiclkly and publically. But the Lone Ranger unlike John Carter did not open widely in all foreign markets at the same time it opened in the US. The Lone Ranger had staggered openings overseas and did not open in Europe and Japan until August. They may have hoped Depp’s overseas appeal may help mitigate the loss. I would alos note that the press coverage was pretty harsh on Lone Ranger as well. There were many articles predicting the Lone Ranger would be the next John Carter before it opened based on the poor tracking numbers just like John Carter. After its poor opening weekend there were many sites already predicting a loss of $150 to $190 milllion. Disney reported their expected loss for Lone Ranger as past of their 3rd quarter report. So it seems Disney wasn’t picking on John Carter. Disney reported earnings that beat Wall Street forecasts on Tuesday amid strength at ESPN and its domestic theme parks but a poor performance at its movie business weighed on revenue. Thanks for pointing out that Disney reported the loss in their 3rd quarter report. Here is the press release they put out, dated August 6. $112 million to $201 million, primarily due to a decrease in worldwide theatrical distribution results. What I don’t understand about your comment is how you seem to be equating that — with what Disney did to John Carter. Let’s review the facts. In the case of Lone Ranger, we have a film that cost $215 to make and has made $175M globally en route to a probable final global total of $190m. JC cost 250 to make and has a final global total of $272M theatrical gross. In the case of Lone Ranger, Disney followed the “usual” pattern of not announcing anything until the next quarterly report — then buried it in the quarterly report. That’s just standard studio procedure. In the case of John Carter, 10 days into the release — when the film had yet to even be released in China and Japan — they head of the studio made a special out-of-cycle announcement that they were taking a $200M writedown. So it’s hardly the same treatment. But it’s not “picking on John Carter” either. I think it’s a little more complicated than that. The press feeding frenzy over John Carter was exceptional — Iger could make the argument that in the case of John Carter, they needed to make the announcement early and couple it with an outreach to all the analysts, reassuring them that even with the $200m writedown, quarterly earnings for Disney would be okay because of …. ta da …. ESPN and Theme Parks. And that’s what they did. But that is the most charitable explanation, and the one that Iger would probably give if he were willing to talk about it. There are other factors — political ones. Disney would not want to humiliate Johnny Depp or Jerry Bruckheimer, whereas there was no equivalent to Johnny Depp in JC, nor was there an equivalent producer to Jerry Bruckheimer. In that sense, politically, John Carter was pretty defenseless — no stars, no big name producer. Did the impending George Lucas deal have anything to do with the decision to decisively junk John Carter only 10 days into the run? I don’t know. Iger was certainly trying to close with Lucas and he may have felt that labeling John Carter as the flop of the century would eliminate any concerns Lucas might have had about having to share the interplanetary limelight. But that’s just speculation. I doubt that would be anything more than a minor contributing factor, if that. I really think that the John Carter narrative had just gotten so wildly out of control that Iger decided the announcement would minimize damage tot he stock price, and that mattered more than squeezing a few more dollars out of the movie’s theatrical run. In other words, the early announcement of catastrophe could be expected to diminish viewer interest and cost some handful of millions of dollars at the box office, but from Iger’s perspective, that was not a problem if, if making the announcement, he minimized the damage to the parent corporation. 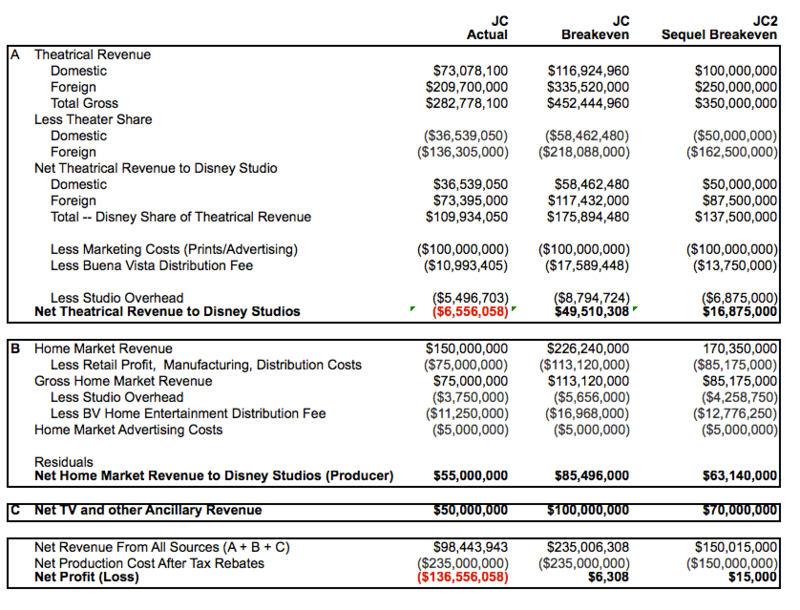 Remember, Studio Entertainment is only 7% of Disney Corp revenue, and John Carter was a subset of that (Lone Ranger too), so no single movie bombing can really move the needle very much on corporate level financials. UPDATE: It’s interesting that in a lot of the press coverage of Lone Ranger today they seem to be upping the budget to “almost $250m” . . . . .I wonder if that came out on the conference call. Remember they were budgeted at $250m and then Rich Ross shut them down until they came back with a revised budget of $215M. Wonder where they ended up. I also saw something saying that total worldwide theatrical gross for Lone Ranger will be $280 when its all said and done. Are they kidding? Where is the additional revenue going to come from? It’s been released everywhere and there’s no way they’ve got 35% of theatrical revenue still out there. but somebody from Disney is spinning it that way, which is interesting. Disney reported their expected loss for Lone Ranger as past of their 3rd quarter report. So it seems Disney wasn’t picking on John Carter. Disney reported earnings that beat Wall Street forecasts on Tuesday amid strength at ESPN and its domestic theme parks but a poor performance at its movie business weighed on revenue. Disney also expects to take a loss of between $160 million and $190 million for “The Lone Ranger” in the fiscal fourth quarter. While large, that’s still lower than the $200 million writedown Disney took on “John Carter” last year. During the third quarter, the performance of “Iron Man 3” also wasn’t as strong as “The Avengers” last year. Disney’s media networks fared better, with revenue rising 5 percent due to growth at ESPN. Operating income at the networks rose 8 percent in the quarter. Higher operating income at ESPN was due to increased affiliate revenues and, to a lesser extent, higher advertising revenues. Yup. I love it. I mean, I hate it. You know what I mean. Can we now officially call The Lone Ranger “the Biggest Flop of All Time” now? 160M worldwide gross compared to a 215M budget+advertising. Where are the press articles about this one? And no announcement from Disney? Is Bob Iger on vacation? The difference in treatment between John Carter and The Lone Ranger is striking. I still believe there is hope for a sequel in the not too distant future — Michael’s calculations show that it would work financially, with only a slightly higher box-office take. We can only hope that somewhere among the possible producers/directors there is an ERB fan waiting for the chance to work in John Carter’s world. As for the financial disappointment of “The Lone Ranger” — I think that was primarily due to the many overall amoral/immoral characters; so I don’t believe there is any correlation between the reception for these two movies. Having the Lone Ranger show up as a positive man of action only for the finale was too little, too late. In comparison, “John Carter” stayed positive and garnered the sympathy of most viewers throughout. Plus, in “”John Carter” there was no fiendish gore, no flesh eating villains, and its humor was not just silliness. Of the two movies, ‘John Carter” is the one that clearly deserves a sequel. pascalahad, I take heart knowing that the property has an 80-year track record of attempted adaptations. Many different talented individuals have seen the cinematic promise of the books. The most common reason that earlier attempts fell through was because the story was too imaginative to be realized onscreen by the technology of those eras (as was the case with Harryhausen in the 50’s and McTiernan in the 80’s, for example). Technology is no longer a problem, and blockbuster effects are no longer prohibitively expensive. Financially speaking, the likelihood of a reboot getting underway increases as time goes by. One worthwhile script and one perceptive industry-leading filmmaker is all it will take to keep ERB’s Barsoom from going back into limbo. Today, film audiences are better primed for “more Barsoom” than ever before. Stanton’s film blazed the trail, whet the appetites of audiences, and has set the stage for a reboot to be surrounded by an underdog narrative that will immediately generate tremendous curiosity once the first announcement is made. The key to keeping that curiosity from becoming schadenfreude will be to cram the project full of confidence-inspiring names. A recognizable and inspiring director, producer, actors, etc. And a marketing campaign with its head in the game. And then, ultimately and most importantly, the film will have to deliver on its promise in a groundbreaking way. The potential to bring all of that together is there in the source material. The property just needs a few key individuals to take up the cause. As far as the budget is concerned, that concern shouldn’t be allowed to put a damper on the screenwriting process. The script should be written as though money is no object, with the sole purpose of doing justice to ERB’s world. Once the project gets some filmmakers involved and things start happening, and the script is professionally budgeted, only then should there be a conversation about the interplay between creative concerns and budget concerns. It would not do justice to the ERB and Barsoom legacy for a writer to be “thinking cheap” from square one. It would be better to go all out in the writing and then have a budget conversation further down the road. With this approach, everything will at least be on the table, before there is talk of compromises. Ultimately, I think there would be more surprise surrounding what WOULDN’T have to be changed for budgetary reasons. Reboots have been done for films that underperformed at the box office, with comparable budgets, and gone on to great success. “Man of Steel” was made for just $40M less than “Superman Returns”, both of them north of $200M, and the new film has already made a couple hundred million more than its predecessor. A lot of the budget conversation for a would-be Barsoom reboot will depend on the quality of the script, who champions the project, whatever “names” are willing to be a part of it, and what confidence the studio has in the assembled talents. I hope I’m wrong but I’m under the impression that Barsoom is going straight to development hell again. Even if the stench of failure is overcome over time, what risk of being left is the feeling that you can’t adapt the materiel for a reasonable price tag. Burroughs never wrote cheap action pieces. Every adaptation so far were eventually abandoned after all. God know I hope I’m wrong. Strangely enough we end up with the opposite sides of the spectrum: the cheapest adaptation imaginable (Princess of Mars) and one among the most expensive movies ever made (John Carter). Between these two there is probably another affordable option. So yes for a reboot, a thousand times yes, but who will be brave enough to touch it? Is Don Murphy still interested? Or Jon Favreau? Maybe but we are talking about Andrew Stanton here, the man who felt he needed to add a pointless back story with Crispy Critter Carters, made Mopey a terrible sword fighter, a clumsy flier and had him run around for 10 years like an idiot trying to find a magic medallion when all it took was risking his nephew’s life to back shoot a Thern. So who knows what other indignities he would had wrecked on Edgar Rice Burroughs’s characters. After all no one changed Tarzan after the first Weissmuller film to make him more ERB like so why would Andrew, especially since he hated them from the start? Well what else is new? Stanton failed to warm up to the fans before the film blew up in his face, why should be start now supporting them or inspiring them. How about they read the books? Maybe then they would realize how great they are and find out how badly Infallible Andrew failed in his blundering of adapting them. Maybe then they could jump on the reboot bandwagon and put this film out of everyone’s memories. That would be the right step. And deep down I think most ERB fans know it but don’t want to admit it since that would admit being wrong about Stanton. But hey no one is perfect-not even Kal-el Stanton-and once they can accept that they will feel better and move on and get excited again. Those new fans are definitely connecting with Stanton’s film, but for all the changes he made that are hotly debated around here, I think what those people are ultimately connecting with is the imaginative and mythic world of Barsoom. Many are connecting specifically with the tragedy of Stanton’s Carter’s backstory, especially in that captivating Warhoon battle scene, but that impactful element wasn’t totally Stanton’s invention. All Stanton did, really, was give Tars Tarkas’ backstory to John Carter, with some added in war-weary cynicism. So, the people who connected with Carter’s tragic past in the film will find plenty of stuff like that in ERB’s world to connect with in a reboot. And a reboot could even deliver it with greater impact, all while being a film easily distinguished from Stanton’s. Stanton’s film is rightly considered as a special accomplishment and a quality introduction to Barsoom, but anyone who sticks around the fandom long enough to see what a reboot could deliver would have many reasons to be optimistic. A reboot will almost certainly pursue a different tone, perhaps something more along the lines of “Lawrence of Arabia”, “Dances With Wolves”, “Braveheart” or “Last of the Mohicans”, rather than Stanton’s “Indiana Jones on Mars”. It’s a pretty safe bet the projects will be distinct when all is said and done, ideally each treasured for its unique approach to the same material. And for all the prognostication about an epic, dramatic reboot of Barsoom, ANY story set on the incomparably imaginative and wild world of ERB’s Barsoom will have adventure and fun aplenty as well. I’ve been voicing my opinion on this for so many years already that it almost sounds cliche to me, but I honestly believe that a full-throttle Barsoom adaptation could come closer to “having it all” than any film before it. Imagination and grand settings, intimate themes and heartfelt characters, adventure and epic scope, beautiful princesses and villainesses, inspiring heroes and abhorrent villains, science and “magic”, Homeric battles and quiet romances. Star Wars, Lord of the Rings and Avatar are in the ballpark, but not even any of those extraordinary achievements quite have the exponential, synergistic effect on the imagination that ERB’s Barsoom has proven to have over the last century. While Stanton’s film was a fun introduction, there is so much more Barsoom to be had. Fans of Stanton’s film who aren’t as familiar with ERB might be skeptical at first, but if the reboot is a just plain excellent piece of cinema and “gets” everything there is to get on Barsoom, paradigms will shift in due time. Abe, thanks. The only one that I was unaware of was “the plant men died on the vine” ….. I’m reminded that certain people here were very good at anticipating his departures from ERB’s JC long before the movie came out, and were able with some accuracy to figure out that Stanton’s fascination was with Barsoom — the world that he first met through the Marvel comics — and not John Carter, the character. I think that, reading the tea leaves of Stanton’s comments, he really has made the decision that he will certainly not be leading a righteous fan-supported windmill tilting extravaganza in search of a sequel. And so I wonder, as time passes and it becomes clear that a reboot is probably the only option …. what happens to these fans? And it’s an important question because for a reboot to make sense to any financing studio, those fans need to support the reboot. Those quotes together convey an impression of Stanton’s John Carter filmmaking being a thing of the past, most of it in his own words. Sequel not warranted… “when (writing a second ‘Carter’ movie) went away”… “it’s an empty nest”. That doesn’t sound like he is hoping or working for a sequel. Taken together, those two tweets seem to convey that Disney is reluctant to undertake a sequel that they fear would be undermined by critics, just like the first film, and Disney would only really even start to think about it if one million fans made their voices heard, presumably through something like a petition. @andrewstanton How goes ‘Gods of Mars’? Trying to get some traction under a push for a JCOM sequel. Saw your name on IMDB. “@Heimdallseesall: How goes ‘Gods of Mars’? Trying 2 get traction under a push for a JCOM sequel.” / The Plant Men died on the vine. Sorry. @andrewstanton “The Plant Men Died on the vine.Sorry.” Is that a definite? We have a HUGE Petition & package to eventually submit to Disney. Those comments from last September, April and a week ago together convey that Andrew Stanton thinks of his John Carter franchise as a thing of the past. It seems that each instance of communication has been clearer about the finality of “no sequel”. Since the release of John Carter, I have not read any communication from him that treats a sequel as a reality. If others know of additional comments from him that shed light on the issue, I hope they share it here. To me, he sounds “done and done” with the whole enterprise. Also where does this belief that we would have gotten a more ERB-like John Carter in a sequel with Andrew Stanton attached came from? As we know Stanton doesn’t think much of the books, which means all of them, not just A Princess of Mars. As shown with comedy Tharks, Sith-Therns and whiny turned Idiot Carter it would be a cold day at Pixar before that would happen. If anyone has proof otherwise being it forward but I doubt it considering Stanton’s flat out hatred of doing anything that resembles ERB. You know perfectly well that from the point he marries Dejah, Stanton’s JC and Burroughs JC are a whole lot closer — he’s certainly got ERB JC’s swagger and mojo. The backstory will never be the same; he’ll never be curiously never-aging yet mortal; yada yada. But he wont’ be whiny/mopey any more unless Stanton has some really strange tricks up his sleeve. Hey Abraham Sherman ….. can you find those Stanton tweets you mention — anything that sheds light on his attitude toward JC? I missed some of those. “Plant men died on the vine” is pretty interesting. As I wrote her somewhere, he did say in an email that he would be interested in coming back to JC when the time is right, if ever, but tweets like that make me doubt it. The “no critics” one sounds like he got too wounded by the critics, and is kind of bitter. I guess he was used to being loved by the critics……. Those tweets — particularly if there are a few more of them — might be significant to the direction ERB Inc goes with its dealings with Disney, etc. Article clearly written by a Stanton worshipper. Yeah Dafoe showed emotion when he wants providing bad comedy and klutzy action. Makes you wonder what movie did this guy see? As for the Willow comparison a better one is Ralph Bakshi’s Lord of the Rings, which took a beloved series, crammed into too much stuff and failed to please anyone except Bakshi’s fans. If we’re lucky and sometime in the future John Carter of Mars gets rebooted people will just look at Mopey as they do Bakshi’s film, as a failed mess. Willow is a good comparison as a stand-alone. In some ways, it might be best that Stanton never gets to make a sequel. I think his Carter could be a long-revered cult classic. That’s not a bad consolation prize. That said, I’m VERY curious what Stanton and his team had in mind for the 2nd and 3rd films. A reboot would likely be very entertaining but surely would disappoint at least as many fans as Stanton’s film did. To me, Stanton did a lot of heavy lifting to introduce us to the Carter universe and to John Carter himself. By the end of the film, there’s a sense that John Carter has become the real John Carter. He’s hell-bent on getting back to Mars. That’s his world now. With a reboot, we’d have to go through the whole exercise of introducing Carter again, and there’s no guarantee that it will be done any better than how Stanton did it. And, in regards to the original topic here, a best-case scenario for a reboot trilogy would be to produce it all at once, saving start-up costs and allowing for shorter release windows, to give audiences greater confidence in the consistency of the trilogy and to keep marketing momentum going strong. While it’s true that hoping and working for a sequel at Disney provides a specific goal for the fandom to rally around, keeping the home fires burning, we can’t ignore the several tweets from Stanton that indicate he will not be making any sequels (“plant men died on the vine”, a sequel would need “a million fans and no critics”, etc.). At the same time, because no one in authority has made a clear statement that there will be no sequel at Disney, it makes sense that many fans are holding out hope for a “Gods of Mars” from Stanton. But, if we think about it, no one at Disney would have any reason to make a “no sequel” public declaration, even if everyone there accepts that as the de facto reality. Making a public statement of that type would only hurt the lasting enthusiasm for the film, and likely hurt any future disc sales or TV deals. So, it might be a bit too much to ask for a clean break for any hopes for a sequel. We’re all going to be left in limbo to some degree, for a couple years it seems. The sequel vs. reboot conversation will likely continue until at least 2015, when the rights are supposed to revert to ERB, Inc.. That is the first sure “deadline” when we’ll learn if Stanton or anyone at Disney intends to continue the series. If March 2015 rolls around and they hold onto the rights, then maybe we’ll get a sequel from Stanton after “Finding Dory”. If they let the rights lapse back to ERB, Inc., then the hope will be that another studio will either continue the series, or do a reboot. Another studio continuing the series is unlikely, with how Disney and Pixar-centric the first film was, but who knows? Series have moved to different studios before, though I don’t know of any severely under-performing films which were picked up for a sequel by a different studio. Plenty of properties which bombed were subsequently picked up for reboots, however. The Hulk and Superman are a couple examples from the past ten years. Giving a fresh start to a property that deserves better (either creatively or in terms of marketing, or both) has been done many times before. All things considered, a reboot seems like the most probable path to more Barsoom on the big screen. My question is how will the fan community that has sprung up because of “John Carter” respond if a reboot is announced within the next couple years, perhaps even before the 2015 “deadline”? Considering the number of people who are passionate about “more Barsoom” taking the form of a sequel from Stanton, one wonders if/when those folks would change gears and support a reboot, if a reboot ends up being the actual form for “more Barsoom”. Something tells me that if/when a reboot is announced, there will still be a vocal crowd in support of Stanton, perhaps permanently. I’d hope that after a while most of the “sequel only” crowd would get behind the new project, while also retaining their full appreciation for Stanton’s work. I enjoy and am grateful for Stanton’s film, but if he isn’t going to get a sequel made, I still want more Barsoom. A new Barsoom film would have the potential to win our hearts at least as much as Stanton’s, and no affection we would gain for the new project would ever have to be considered a slight toward Stanton. When I think about my hopes for how things could go with a new Barsoom series, there’s an example of some favorite films of mine that keeps coming to mind. My favorite stand-alone fantasy film is “Willow”. Lines from that movie rattle around in my memory and evoke a ready smile. It’s almost “Indiana Jones” style approach to fantasy fun, adventure and imagination entertained and inspired me as a kid, and continue to do so. For how much I love “Willow”, it isn’t the end-all of fantasy films. Now, if we think of Stanton’s “John Carter” as the “Willow” of Barsoom films, we can fully appreciate it, while also leaving room to embrace something else that might come along and be more of a “Lord of the Rings” of Barsoom films (LOTR being another fantasy story that I also love). At the end of the day, if we ended up with a “Willow”-style Barsoom film (Stanton’s “John Carter”), and a LOTR-style Barsoom series (yet to be seen), I would count myself as one happy ERB fan. The problem with thinking Stanton would keep costs down is that Pixar doesn’t do that. Pixar reshoots movies. Stanton reshot John Carter of Mars. Disney gave him no oversight and let the budget soar out of control. (By the way, Stanton also controlled the marketing of the movie, wanting for some reason to “preserve the mystery” of a story putatively based on a century-old novel.) only a complete imbecile would think Stanton wouldn’t demand an Andrew Carnegie-like fortune for the sequel and full creative control again. This makes John Carter: The Gods of Mars an absolute nonstarter after the debacle of John Carter of Mars. Movies that lose as much as Stanton’s epic did don’t get sequels even with fervent but small canvases. John Carter of Mars failed to either tell a compelling story or tap into a cultural zeitgeist that would enable profitability. A sequel would be effectively a retread of established ideas with no proven track record of success. That essentially tells me the sequel will exist only in what the film version of the Great Library of Pseudobiblia at Oz is. Keep in mind that Stanton has re-written the Therns. In the books they are the Holy Therns, white as white can be with blonde wigs. John Carter exposes the Barsoomian religion (and by extension all religions) to be false. A fair-skinned race considering themselves superior, combined with an anti-religion theme would be tough on Disney. There is also nobody mentioning the Black Barsoomians. While watching JC I got the feeling the studio felt they had to change the original stories in the interest of being politically correct. It seems very doubtful a sequel happens, but if Stanton REALLY wants to make one, and if Finding Dory scores big for Disney, maybe it’s possible Lasseter will work hard to give Stanton his wish. I think even the hard-core ERB fans who dis-liked some of Stanton’s ideas would admit that by the end of the film there is strong potential for a more ERB-like version of John Carter in the sequel. For me, I thought Stanton created such an interesting fantasy world of like-able characters that everyone who saw the first one is curious about what happens next. By the time a sequel would be made, Disney and Stanton would have had TONS of time to Monday-morning quarterback the supposed “flop” and to game-plan a marketing strategy to best sell a sequel. Stanton supposedly had a very detailed outline for 3 films. IF a sequel was made, I’d guess the 2nd and 3rd films would be filmed together. They must have spent a lot on the first film in simply creating the world that is John Carter. Now that the world and characters have been created for the most part, the art cost would seemingly go way down. Maybe lessening the budget would the easy part of making a sequel. Erasing the stigma is probably the hard part. The Disney Princess movie Aladdin had 2 separate releases. Do the same with re-titled original JC1, John Carter and the Princess of Mars. This re-release adds revenue to JC 1 and before re-releasing it, adjust for less graphic stabbing & blood, also don’t show Original Mother and Daughter’s dead bodies. This will make JC1 more kid friendly and increase revenues. Just blurr the stabbings and cut the dead Mom & Daughter pictures on floor of cabin and in grave. Easy to do. Then work on JC & POM 2 & 3, paying for it partially with re-released revenues. It’s a Disney Princess Movie! (Like Aladdin, Beauty/Beast etc.) Market it like one. And hurry, no one is getting any younger. Go Girls! The only thing about reboot vs sequel is that the logic of one-time-costs not having to be absorbed by one film goes away. But that doesn’t mean a reboot can’t be made for a better price than Stanton’s film. Re budget — Stanton comes from Pixar and their budgets are really just a function of how big an army of animators/3g artists need to work for how long. The JC script involved more animated shots than a typical Pixar animated film — and with those films averaging 200M++ in a way it’s a miracle it didn’t cost more than it did. But that’s because it was a Pixar production with live action thrown in. If it’s a reboot, then the Pixar approach probably wouldn’t be relevant. As for “compromise” — any live action director will tell you that they have to “compromise” every time they make a movie. They never get everything they want. It’s just a natural part of the filmmaking process. At the end of the day, it’s a business. Right now, like it or not, Stanton’s JC has established a realistic “bottom” for the market that would exist for a second film or reboot. It’s reasonable to assume that with good marketing and growth in the international marketplace, (especially Russia and china), a sequel or reboot could have a realistic worst case performance of $350M. But is $450K a realistic minimum? My concern is just that the bar ends up being too high ….. and nothing happens. I’ve no idea why that fragment posted…please remove it if you want. Now we’re going to compromise the sequel even more in order to get it made? now that we’ve gone down this Stanton/Carter path, if one remains true to ‘his’ story – where’s the sequel’s story going to go? Carter goes back to Earth, (after leaving DT pregnant; she pines for him), he finds a way to get back, meanwhile she heads for Dor…and the air plant needs a-fixin. Except – Therns. Why would they let Carter return? DT knows about the transport net now – so no need to pine, just gain access to a key and bring Carter back – or go to Earth. For that matter, the Therns ought to be doing everything they can to eliminate DT for her knowledge. And why do the Therns need a valley Dor at all? – at least half of Mars knows about them and their shape-shifting, manipulative ways now – Tarkas sure won’t keep quiet. He could probably unite all of the green martian tribes under the banner of – da Therns what been making us fight! Helium and Zodanga won’t keep quiet and between them they’ve got the greatest army and combined fleet on Mars. What could the sequel be other than the fight to free Mars from the Therns combined with DT’s quest to get Carter back – which pretty much paints JC right out of the picture for the most part. I think if we really examine the possible, logical plot lines that the sequels must follow from episode 1, we’re going to find that not only isn’t it really JC’s adventures on Barsoom anymore, but that Stanton, by introducing the Therns, has written himself into a corner from which there is no escape. REBOOT is right. It’s the only remaining way to go. One correction. When I wrote I “doubt he would do the same” I meant I doubt he wouldn’t do the same when it came to adapting Gods of Mars. He showed zero respect so he would probably do the same thing. Just to clarify. I guess the Back to Barsoomers need to prove this didn’t lose money to back up their beliefs-some of them crackpot-that there arch nemesis Iger was behind this. With regards to what Pascalahad wrote about following the structure and tone of Gods of Mars, considering that Andrew Stanton chucked A Princess of Mars into the trash when he made Mopey Carter I doubt he would do the same, especially since Carter was more of a “vanilla” hero there-saving Barsoom from the hell of the Valley Dor and refusing the advances of both Thuvia and Phaidor-that wouldn’t work for “damaged goods” obsessed Andrew. Probably explains his comment about Plant Men dying on the vine, they don’t fit his vision. Besides with shape shifter Shang and his super Sith-Therns you got to figure Issus and the First Born were rewritten as giant lizard robots who spit fire. Which is really cool to kiddie cartoon directors who don’t read books they claim to be fans of. Sorry to be more contrarian than usual but at this point the BToBers need to give up or refocus because Disney is not going to make a sequel. It’s time to petition for the rights to be given back to ERB Inc and reboot (even though they need to be more involved, not just cash the checks and agree with whatever they’re told). On an off question is there any reports from the ERB panel at Comic-Con? Outside some photos of one of ERB’s great grand daughters dressed as The Cave Girl, and quite attractive too, I haven’t found any reports. Maybe they talked about the future of John Carter of Mars. If Andrew Stanton somewhat kept the structure and overall tone of Gods of Mars, there is no reason for it to cost even as much as John Carter. There are no new Tharks “actors”, there are extras in the battle scenes, for whom the R&D is done. The new characters are humans (well, perhaps except Issus, depending on how they conceived her), and with probably way more Dejah included. New creatures are Plant Men and Banths, the latest being already designed. A less budgeted and successful part two would be the best way to show if there is really interest from the audience that discovered John Carter after the fact. I read a tweet from Andrew Stanton stating that the Plant Men had died on the vine… not encouraging, but I keep my fingers crossed anyway. The secondary market has been kinder to JC. It was on Stars for an additional 3 months … It’s on Encore now. And I’m sure it still is in the movie libraries of several airlines. That’s enough to keep the first fim in the black.